“The trick is trying to be a responsible teammate and co-leader and understand that Alberto could not just be stronger, but could be a lot stronger,” Armstrong said of Contador, who won the 2007 Tour as well as last year’s Giro d’Italia and the Vuelta a España. I don't recall Armstrong ever admitting that another rider, even a teammate, is stronger. You could call this year's Astana team the New York Yankees of cycling. The team has four riders who have finished on the podium in the Tour de France: Armstrong, Contador, Andreas Kloden and Levi Leipheimer. These guys will be intimidating in the mountains. Johann Bruyneel's instructions to the team will be to deliver Contador to another victory, and if anyone else makes the podium, so much the better. 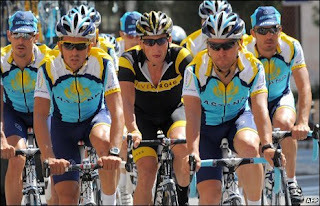 Bruyneel's team (then Discovery Channel) was able to do just that in 2007, when Leipheimer came in third while riding in support of Contador. In 2008, before Armstrong’s return, $7,675,000 in donations came in during those quarters. In 2009, with Armstrong back, $8,056,000 came in. More yellow rubber LiveStrong bracelets have been sold, too: 1,987,000 from January to May in 2009, up from 1,298,000 during the same period in 2008. The sprinters will get their week of glory before the Tour heads into the Pyrenees next Friday. From there, the riders will have to pull themselves through seven more mountain stages before heading into Paris on July 21.